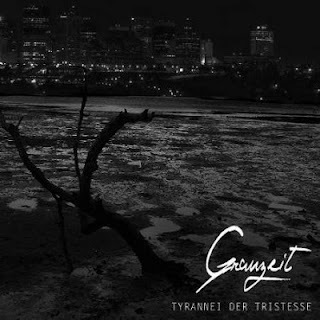 If you enjoy melancholic metal with a small twist in its sound then the new EP, Tyrannei der Tristesse, by Germany's Grauzeit is for you. I remember hearing the first EP entitled Dieses Gefühl jeden Tag sometime last year and quickly became a fan of the band. The band went on to release a demo and then the weird but fun experimentation sounds with 440 The Remix Suite. With the Remix Suite, the band added even more experimental and trippy elements. It took some time to get accustomed to that sound but it managed to sink in after a few listens. The release of Tyrannei der Tristesse is about the same and takes a swerve in the musical direction of the band yet again. It's sort of like a collaboration of Dieses Gefühl jeden Tag and The Remix Suite and a bit more. While still fixated to the melancholic sound they include some sort of experimental trip-hop vibe to it, well the instrumental tracks anyway. Yes that sounds a bit peculiar but the band pulls it off in an acceptable fashion. Sure some people will say it's not their cup of tea and I can understand that but like I said the band pulls it off beautifully. I thought 440 The Remix Suite was even weirder when comparing it to this EP. Going on to the EP, the concept of the way the tracks are layed out are instrumental track, then an actual track with instruments and vox, instrumental track, and then again a full on track. So basically what you get are three instrumental tracks and two actual tracks with guitars, vox, and what not. The three instrumentals Tyrannei der Tristesse I, III, V are pretty remarkable. The instrumentals are all pretty unique in their own way. Tyrannei der Tristesse I brings out a trippy yet spacey melancholic sound. There are a lot of beautifully done arrangements on this track especially the piano parts. It will defintiely have your mind at ease but at the same time cloud it in a melancholic frenzy. Tyrannei der Tristesse III continues in the same fashion. Violin sounds, beautiful piano compositions, atmospheric, and a bit more upbeat. Tyrannei der Tristesse V ends the EP in a trippy, somber, and mellow kind of way. This is the track that I can hear most people saying "What the hell is this?" Again very mellow and experimental but that entitles to all the instrumental tracks. Tyrannei der Tristesse II and IV are the more traditional melancholic post/black metal tracks that the band is known for. Fans of the genre will surely love these two tracks. Tyrannei der Tristesse II will have you bounded with its sorrowful and stellar sound. The melodic guitars of Argwohn play a key role in the sound. There lots of killer and wistful riffs through out. At times the song even transcends into a doom/death rock melody. One can also appreciate the bombastic drumming of member L. When you listen you will understand. There are various tempo changes which is nice as it doesn't drag with a long constant mediocre sound. Tyrannei der Tristesse IV is the track that out shines the bands talent in my opinion. The song sways in many directions from time to time. From the more softer and somber clean guitar moments to the more aggressive yet melancholic riffs and blast beats. The song builds up nicely and you will be head banging with the more faster moments of track. I can guarantee that. While listening to Tyrannei der Tristesse IV you can point out the many styles of black metal influenced. This is for sure a remarkable track for the fans to intake. Overall this EP is pretty killer. It's a very peculiar record but killer. Yes, it's different on so many levels but that is what gets a band noticed. I am glad Grauzeit ventured on to this style of music. It's really not like any other band out there today. The term Urban Musickness surely entails what the band is capable of. And as I have stated before this is probably not for everyone's taste. It is for those who have an open mind and don't mind a band venturing into new territories with their sound. If that is you, then give the band a chance. I've also heard the band is beginning preparations for a full length album soon. One can wonder what the band will create, re-create, or bring new to the table. I'd also like to note that you can stream or download their releases off the bandcamp page.